The current Science Communicators in Residence Dan Falk moderated two science communications events, while the upcoming Science Communicator in Residence B.D. Colen participated as a panellist, along with Dawn Bazely (Biology) and The Globe and Mail science reporter Ivan Semeniuk. 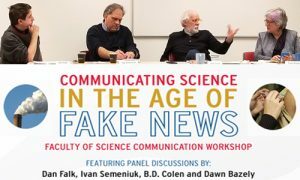 The seminar Issues and Challenges in Science Communications was co-hosted by the Faculty of Health in the afternoon, while Communicating Science in the Age of Fake News workshop took place in the evening. Steven Wang (Math & Stats) is one of the co-principal investigators with the principal investigator, Associate Vice-President Research Rebecca Pillai Riddell, to receive a $1M CHIR grant for the project, Rebooting Infant Pain Assessment: Using Machine Learning to Exponentially Improve Neonatal Intensive Care Unit Practice. Conor Douglas (Science & Technology Studies) gave the presentation titled “Can we Put a Financial Value on Life? Coverage Decision-Makers and Future Challenges and Uncertainties Related to Drugs for Rare Diseases,” as part of the STS Department Seminar Series on March 26. An Open House for students to learn more about their math courses, how the new Experimental Math Space will play a role in their math lectures, and talk to professors took place April 9, from 10am to 12pm. Denuded Dwarfs Demystified: Gas Loss from dSph Progenitors and Implications for the Minimum Mass of Galaxies by Marshall McCall (Physics & Astronomy) and Nina Ivkovich,(an undergraduate major in astronomy whose work as a summer research assistant helped forged the way forward), was published in the Monthly Notices of the Royal Astronomical Society. Their research helps explain why dwarf galaxies in a state of transition are rare and consequently why dwarfs with a potential shallower than the critical value form two distinct sequences. “Proteomic Analysis of Histones H2A/H2B and Fariant Hv1 in Tetrahymena thermophilaII Reveals an Ancient Network of Chaperones,” by Ronald Pearlman (Biology) and his former grad students Kanwal Ashraf and Jeff Fillingham (now at Ryerson), along with research associate Jyoti Garg, and others was published in the journal Molecular Biology and Evolution. It provides the first comprehensive view of T. thermophila histones H2A, variant Hv1 and H2B protein-interaction networks. Grad students Shelby Gibson and Amanda Liczner (Biology), along with Sheila Colla (FES/Biology) published a new paper in the Journal of Insect Science: “Conservation Conundrum: At-risk Bumble Bees (Bombus spp.) Show Preference for Invasive Tufted Vetch (Vicia cracca) While Foraging in Protected Areas.” The research found differences in foraging preference between common and at-risk bumble bee species. Dorian Deshauer was quoted in the New Yorker – The Challenge of Going off Psychiatric Drugs – about his doctoral research. His supervisor included Kenton Kroker (Science & Technology Studies). Paul Delaney (Physics & Astronomy) talked to AM640 about the Lunar Gateway and Canada, ISS medical results, and the NASA spacewalk and ET, as well as with Newstalk 1010’s Mark Tawney about the CSA and the Lunar Gateway. He was also on the AM1010 John Moores show discussing the Crew Dragon. May 11: Science Rendezvous is once again gearing up for another successful event with DNA bracelets, giant scrabble, water piano, a fire tornado and more. It will take place on Main Street in Markham (132 Robinson St.), from 10am to 3pm. May 13: The conference, 50 Years of Set Theory in Toronto, will introduce and/or survey contemporary work in the areas currently investigated by Seminar members. The conference will take place at the Fields Institute in Toronto, and is supported by the Fields, NSF and NSERC. 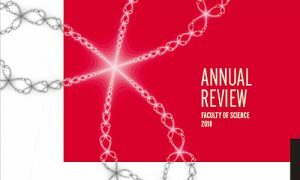 For more information, including registration, fees and abstract submission, visit the conference website.